Full-Color Commission for of a scene from his AU!TLG story. It's post-Simba's Pride, the Pridelands are safe and strong, and poor Prince Kion's having an identity crisis. Note: Just to point out, in this AU story Kion was born after the events in "Simba's Pride" and no-one has thought of establishing a new Guard team yet. I wish I could hug Kion. I'm not surprised. He's so cute. Identity Crisis? Is he crying because now that the Pride Lands are safe and sound, and no trouble is caused, because of Kiara, and Kovu restoring the Pride to it's former glory and The Lion Guard is no longer needed? Or was everything Kion has been through, and his duties as the leader of the Lion Guard were all a lie? Identity crisis, meaning that he was never supposed to exist? Sort of. Basically the Pridelands are doing really well at this point, so no one's ever mentioned or brought up a need for the Lion Guard, so Kion's left feeling pretty useless. That doesn't last for long though. Then why do I feel like the Lion Guards are coming to a close on Disney Jr? 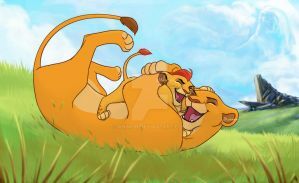 Fantastic pic of Kion and Kiara!!! You draw them both SUPERBLY! WONDERFUL JOB!!!!! Can you draw wolves? I'd love to commission you sometime! Yeah I remember you! And honestly? If I'm not posting, just assume I'm lurking about! Heck yeah I can draw wolves! Got a couple in my gallery already! Feel free to try me! I absolutely love the way you drew Kion! Great job! Cheer up kid. You've still got super powers, and ones that can make it rain, blow away clouds, and summon the literal forces of lion hell...that last isn't exactly a positive, but that depends on how you spin it. Also, very lovely piece, nice shading and texture to really bring out their expressions. Poor kid is probably worried about becoming just like Scar. It's a positive that he has such a supportive and loving big sis! Basically at this point Kiara and Kovu have everything in the Pridelands under control, so Kion's left feeling pretty useless. The new Guard hasn't quite happened yet. 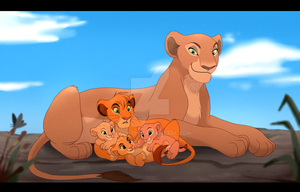 Your TLK art's quite nice. Aww, thank you! I may not always be able to post, but I'm probably still lurking around!